On of the leaders of the opposition of the government of Michel Martelly has been put out of commission on the eve of a major protest. 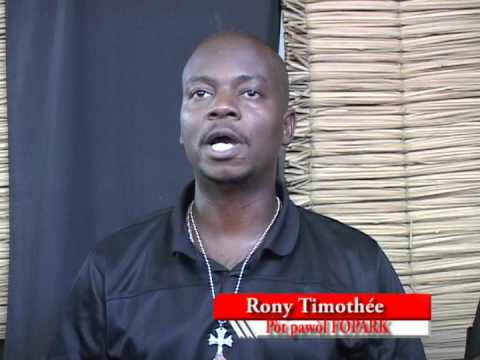 Rony Timothee was placed in custody in Petion-Ville. The leader of the Lavalas FOPARK party, Rony Timothee, a fierce opponent of the Martelly / Lamothe government, received his arrest on Saturday afternoon in a location not far from Toussaint Louverture International Airport. According to Radio Kiskeya, Rony Timothee was taken to the Central Directorate of the Judicial Police ( DCPJ ), the later placed in custody at the police station in Petion -Ville . Even four years after the devastating earthquake that tore apart Haiti with 160,000 deaths, the country is still bearing the scars. The dependence on the foreign aid has skyrocketed. Haiti is not the easiest place to do business. The country lacks good ports and roads, electricity and good supportive institutions. Haiti has remained in ruins. Its desperately needed reconstruction projects and infrastructure are still in firm foreign control. The government at Port-au Prince is failing within an impoverished damaged economy. 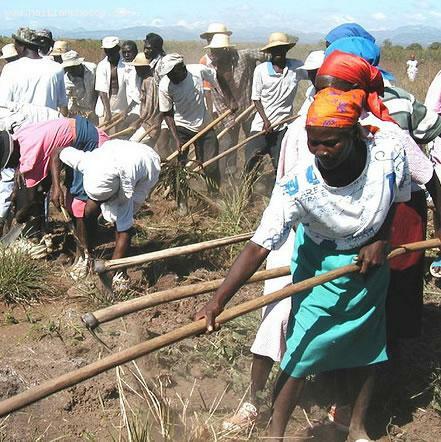 Haiti is the poorest country in the Americas with low labor cost and tariff free export dumping market for its closest neighbor U.S. More than 40% of the Haitians are subsistence farmers who mainly focus on growing enough food to feed own families and are subject to vulnerable to damage from recurring natural disasters. A call has been issued to the youths of Haiti. By whom has it been made? Former Haitian President and professor Leslie François Manigat is the man responsible for the call that would mobilize the young in Haiti for the purpose of changing the future through politics. The Rally of Progressive National Democrats (RDNP), represented by current coordinator for National Youth Council of the RDNP, Présumé Montès, wants Haitian youths to join the party, following the bid of the former president and founder of the party. Describing the current course of the country, under the regime of President Michele Martelly and Prime Minister Laurent Lamothe, as a "shipwreck", the party promises to train the young recruits to become capable leaders. Why do Haitian Politicians love power so much? We Haitians do not agree on many things; however, this is something many Haitians will agree on. 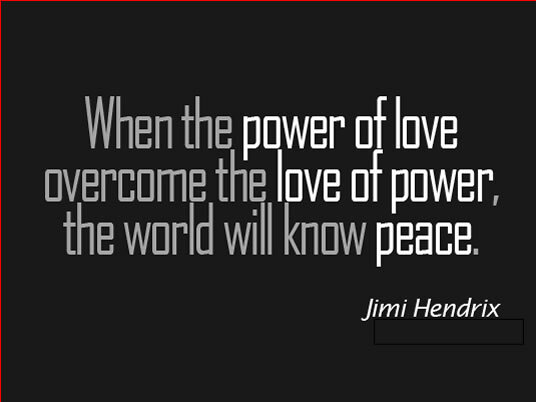 Haitian Politicians are in love with power. For those who may not agree with me, you don't have to go far to see to what extent our politicians would go to be in a position of power. Just take a look at any election in Haiti, you will see the number of people wanting to occupy those positions of power. During a typical presidential election in Haiti, the number of candidates can reach anywhere from 40 to 50. During a Cabinet formation or reshuffling, some people you would not expect give up their dignity, prestige or affiliations they spent years building in a matter of second just to become the next Minister or Secretary. Meznmi, ki lè problem ap fini nan payi sa? Me konyè-a mwen tande ke Prezidan Martelly pa ka mete an aplikasyon atik 12 nan Accord ki te fet nan El Rancho Hotel la. Mwen fini pa ouè ke dlo pran acord sa oui. Gouvenman-an te panse li te kapab bay Sena sa yon kout pwin anba tivant lè ke yo mete ke si Sena-a pa ratifye El Rancho accord a nan 10 jou, yappe passe yon vitess sipeyè et organize eleksyon an kan minm. Before I go on, I want to make this clear: Yes, many women in the Haitian society have been raised with an inferiority complex as to men. Unfortunately, it was thought to them by their parents who did not know any better. Many Haitian women have been raised to believe that the man is God, unable to do anything wrong. They were also thought to accept almost anything from the man. This time is long gone and thanks to the improvement in technology and communication, every single woman in any corner of the world knows better now. Economic issues or not; with consideration for children, family, society or not, they have learned that their self worth is more important. The Haitian government has been trying to resolve its internecine conflicts and the pressure is on to sign a political agreement within the next 24 hours. Bishop Aris verified that Phase II of the Inter-Haitian dialogue had begun, and the participants had 24 hours to come to an agreement that would restore stability to the government. Senator Desras does not feel Parliament has been given enough say-so during the proceedings. He says that even though Parliament is a primary player in Phase II, it was not given a big enough role during Phase I, as it ". . . should have been mentioned as a witness." Desras also says it is best the political agreement be signed once all conflicts have been resolved with the Executive Branch. He anticipates President Martelly will be one of the signatories to the agreement. He adds the signature of President Martelly is just a formality, although an important one, that it ". . . is not his signature but its implementation . . ."
It seems like no one can touch Haitian Prime Minister Laurent Lamothe. According to Political Analyst, Daly Valet, this Government shake-up confirms that the Prime Minister has a hold on the Government. Daly Valet went further to say that Prime Minister Laurent Lamothe Laurent Lamothe has been the most powerful Haitian Prime Minister since the adoption of the Constitution of 1987. Now do you agree With Political analyst Daly Valet? Do you think that Prime Minister Laurent Lamothe is is the Most powerful Prime Minister of Haiti? According to Daly, the new government is rather a government of closure, from Tèt Kale to Tèt Kale. I have also heard that this new Government shake-up was made in a way to have control over the next Presidential election of 2016. Senator Simon Desras is trying to get out of signing the Inter-Haitian Agreement by saying his role is that of a witness, parlance for non-existence status. He is being pressured on one side to sign as an Independent Observer (IO) by the Episcopal Conference of Haiti (CEH), and not to sign by six of his senate colleagues. The mediation protocol states political parties, the legislature, and executive are all stakeholders to the Inter-Haitian Agreement. But Desras disagrees, claiming the Agreement is a consensus only between political parties and the executive. The CEH says Desras is wrong on two counts: one, Parliament is also a signee of the Agreement, and two, Desras is an IO, not a witness. As an IO, he participates indirectly in the discussion, forwarding his opinions to the Mediator. Without much surprise to anyone, Haiti's lower chamber of deputies passed the amended electoral law on Tuesday, April 1, 2014. Will the Haitian do the same? 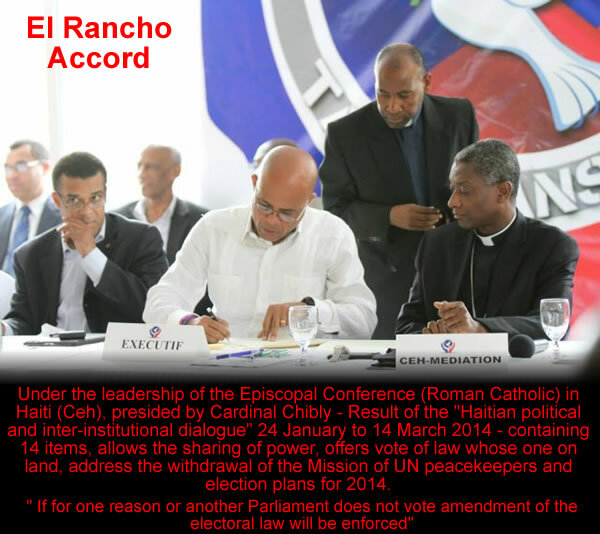 The El Rancho agreement signed on March 14 and 19, 2014 between the Executive and the Legislative Powers, as well as several Political Parties under the auspices of the Episcopal Conference of Haiti is taking its course. As the executive branch is currently under some heat to hold election this year, they are now doing all in their capacity to make it happen. Now it is up to the Senate to vote on the amended electoral law. We all know already that there are six of the 20 Senators who completely objects to the El Rancho agreement. Does anyone know how this will end up? Will article 12 be implemented?